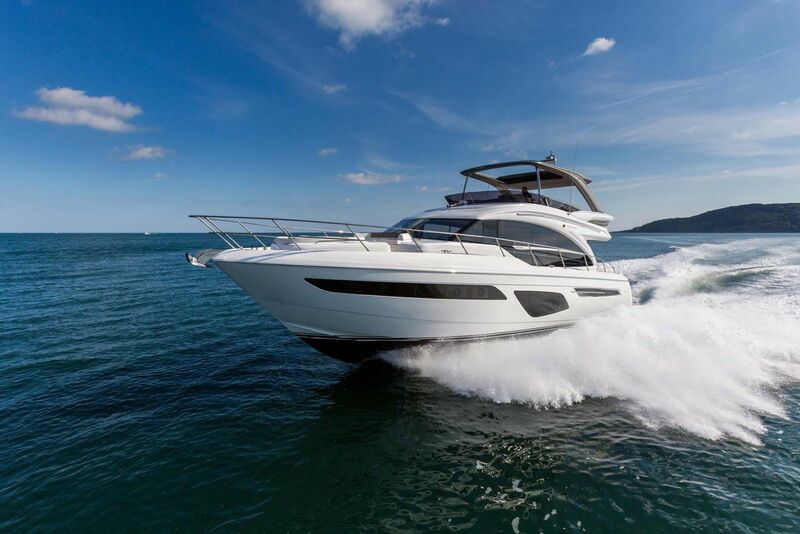 Back when the Princess F43 Flybridge was first launched in 2013, it was the next generation of the popular 42 Flybridge which produced more than 300 vessels. 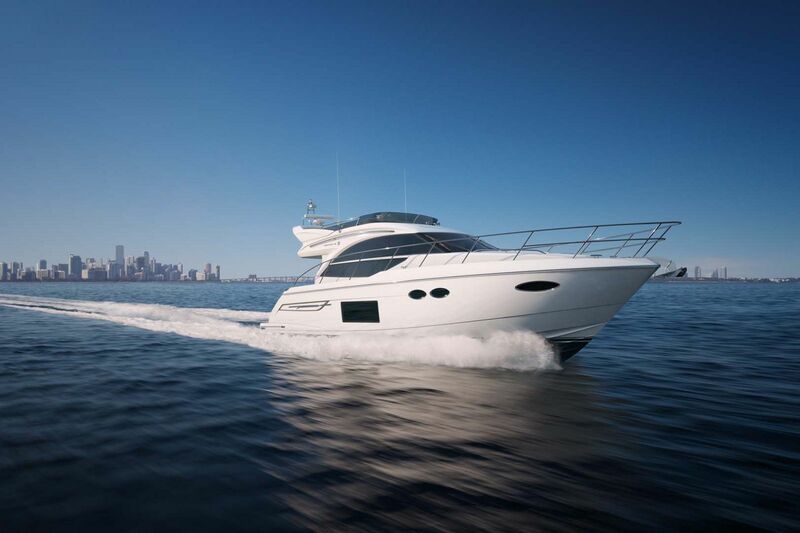 With the success of the 42 Fly, the Princess design team knew that the F43 Fly would have to expand on the same features that were popular on other models. 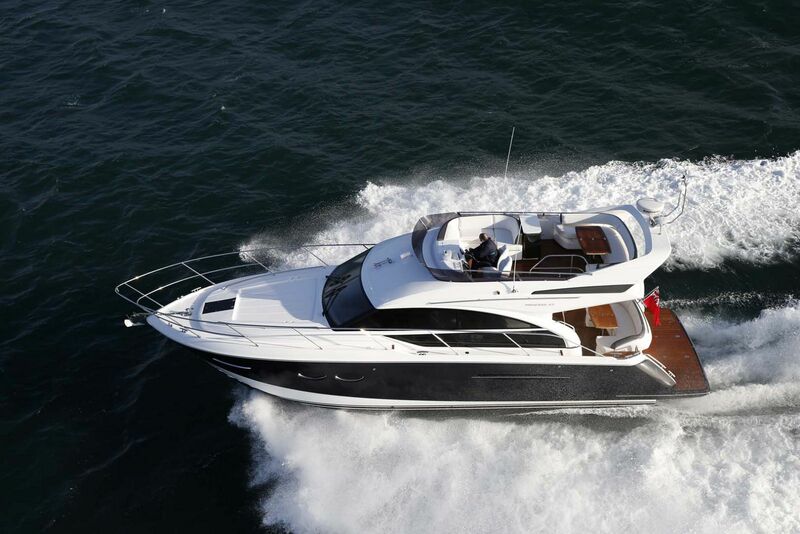 Taking cues from the larger 52, and now 55 Flybridge, the 43MY has a similar two-cabin layout, shard exterior lines, and a more contemporary interior that fits with today’s modern styling. 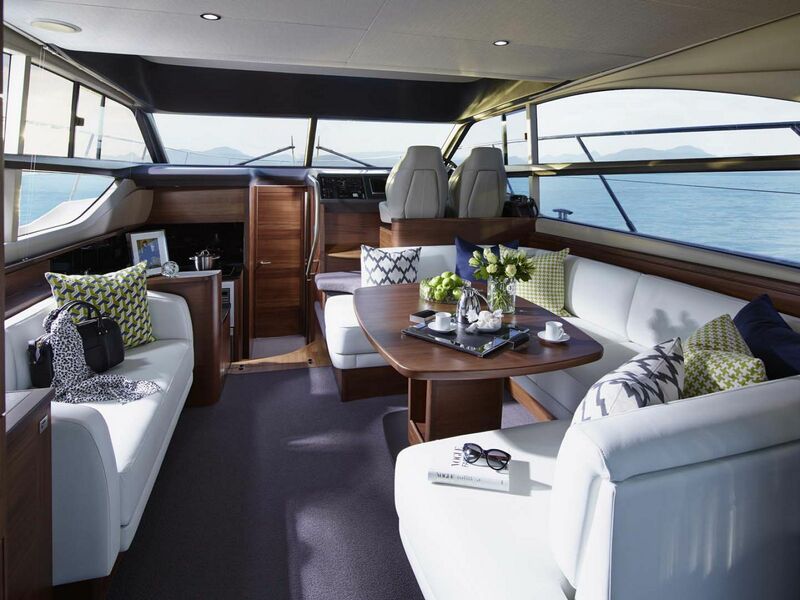 And of course, Princess kept all of the favorite seating configurations that maximize the social aspects of the boat. 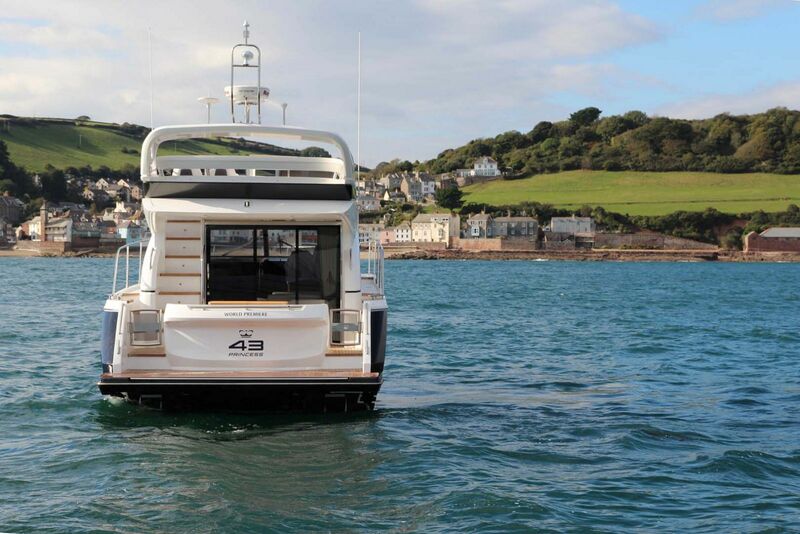 Boarding the Princess 43 Fly is easily done via the swim platform or through one of the dual gates that go right into the aft cockpit. 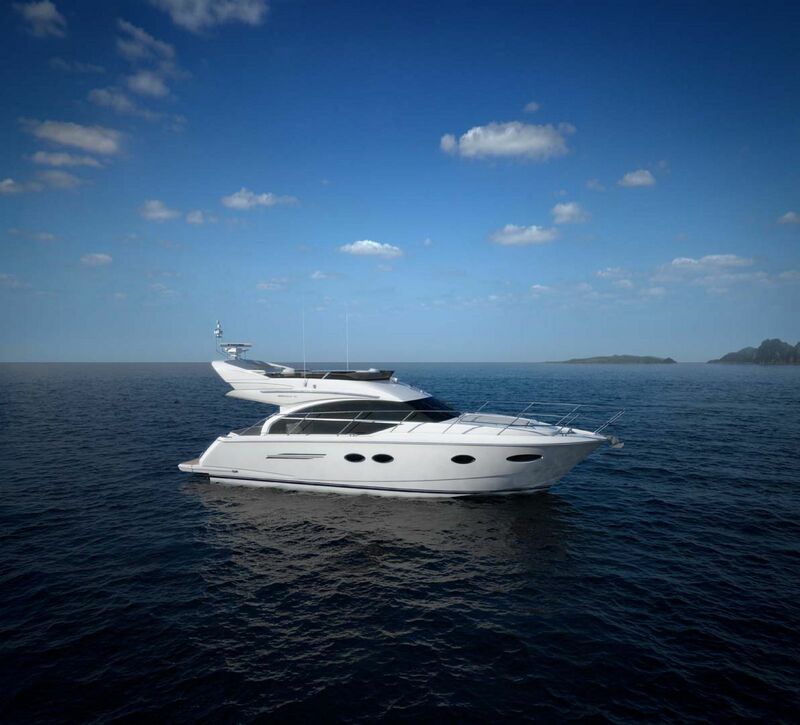 Princess does an exceptional job at creating flybridge spaces that are comfortable for the captain and the guests when at a slow cruise or docked, but the 43 Flybridge is fast and meant to be driven. 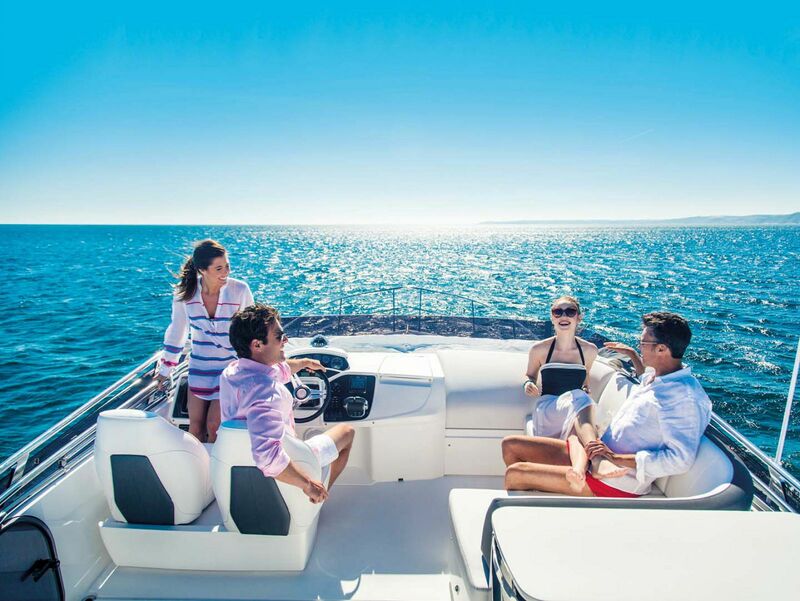 When the throttle is down, everyone on the bridge will enjoy the twin helm chairs and U-shaped seating around the dining table that keep them comfortable and help avoid spilling drinks. 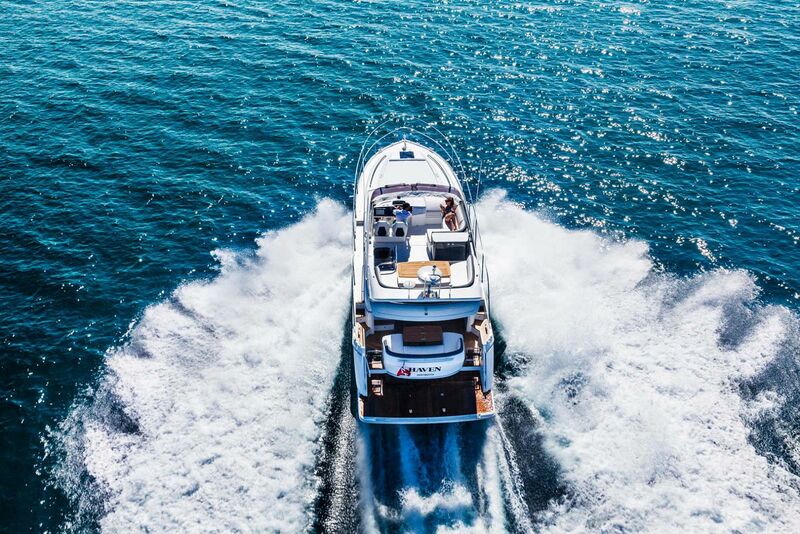 With a deep-V hull design and advanced composite materials and construction on the hull, the 43 Flybridge is incredibly stable which is apparent at anchor or underway. 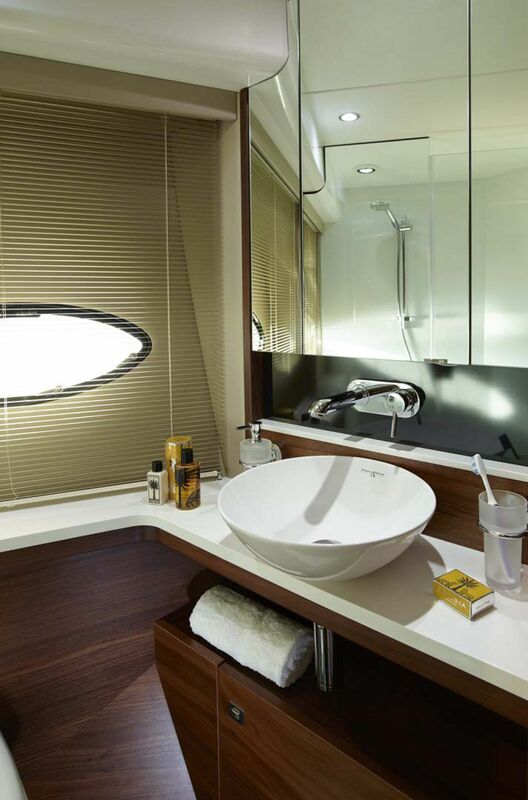 It’s easy to forget that this is a 43-foot yacht when venturing inside the salon of the 43MY. 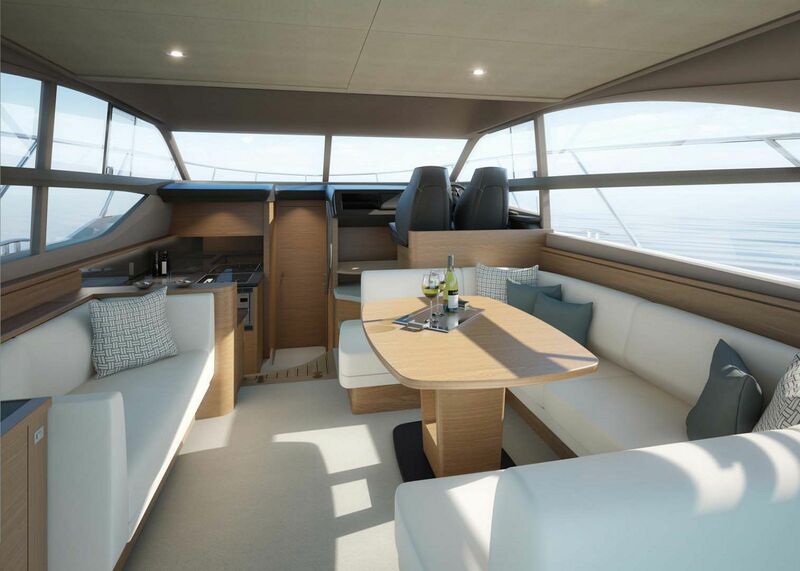 A cushy U-shaped sofa is immediately starboard with a raised dining table that can comfortably seat 6 people. 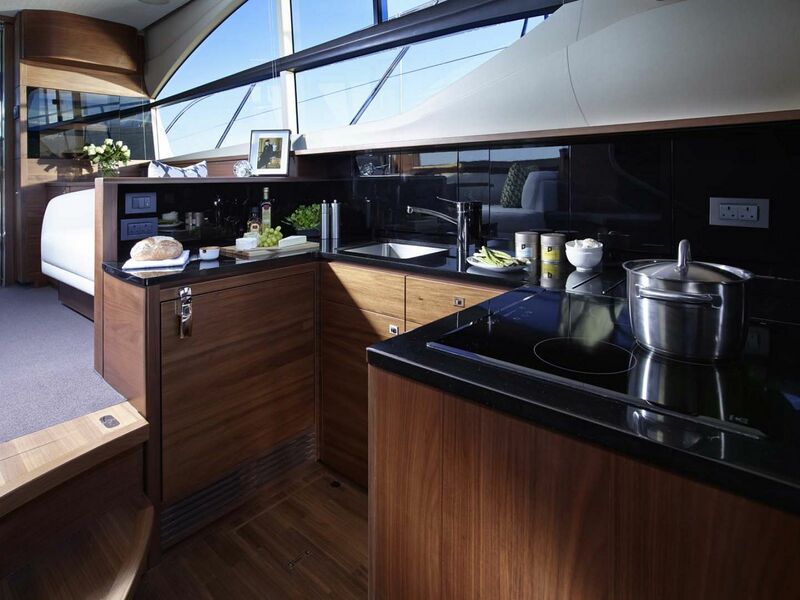 Across from the dinette is another 3-person sofa along with storage cabinets. 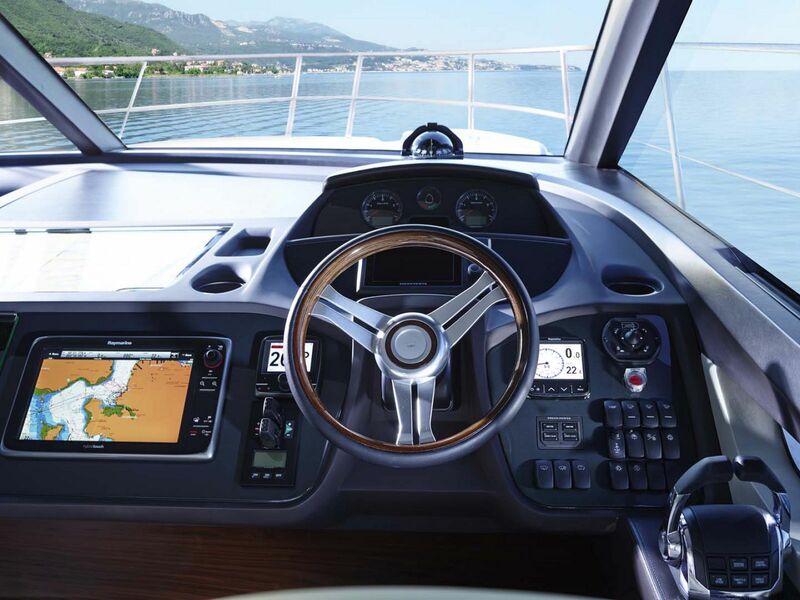 Forward is the interior helm station that has a two-person bench seat, an ergonomic design, and all of the needed electronics as well as joystick control. 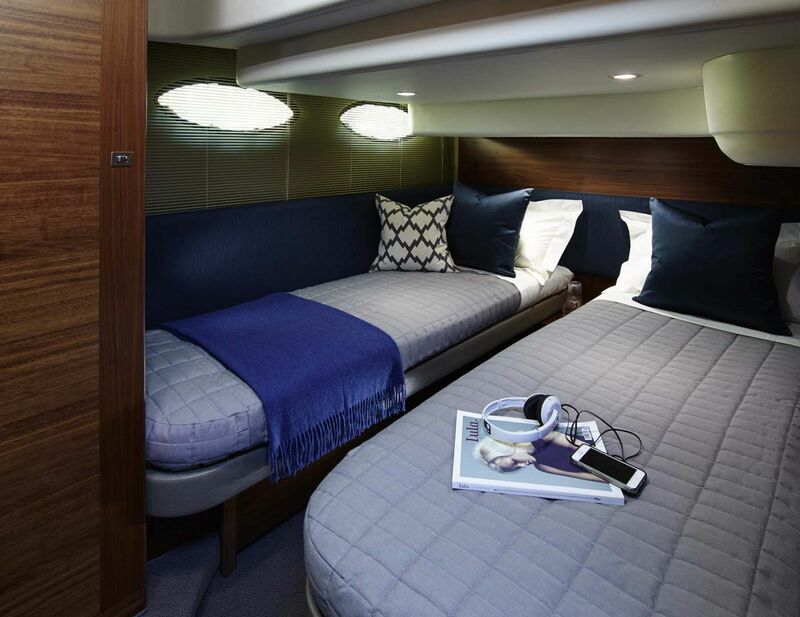 Extended trips don’t have to be uncomfortable with the plush beds and comfort features in the 43 Flybridge’s staterooms. 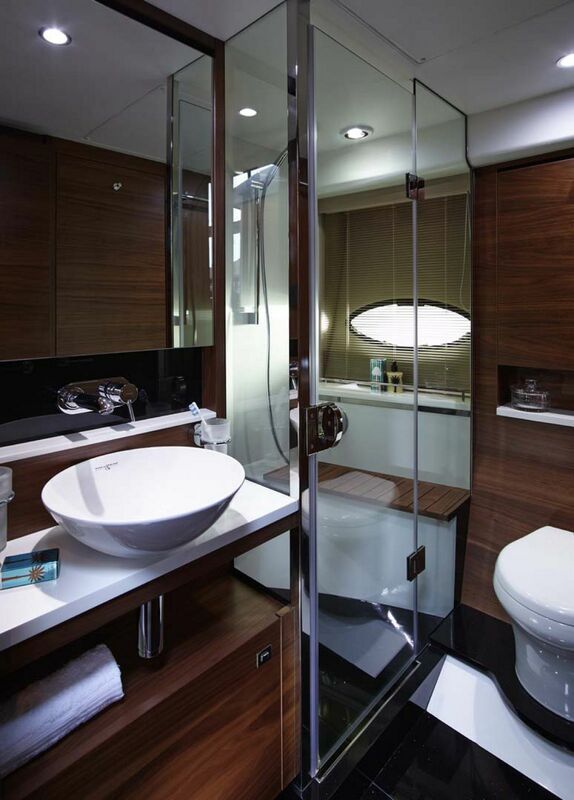 Both cabins on board are down and forward with the master stateroom in the peak and twin berths on the starboard side. 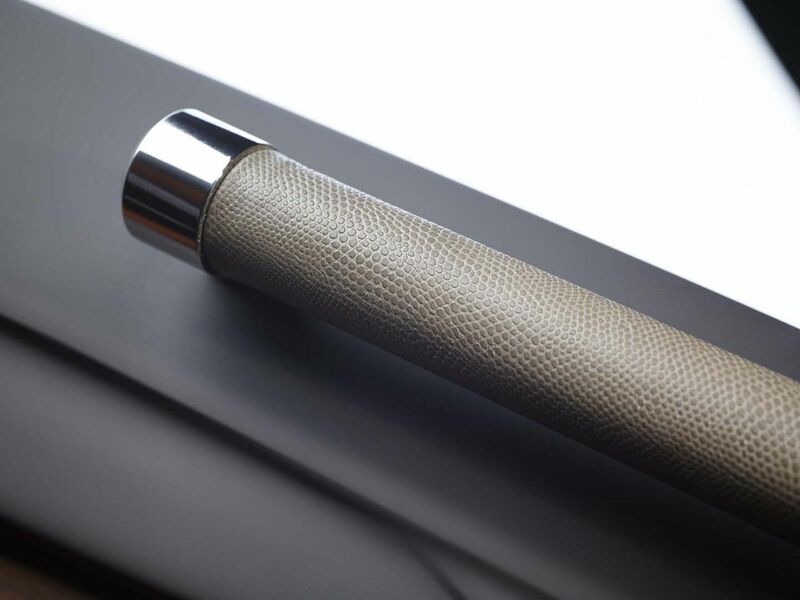 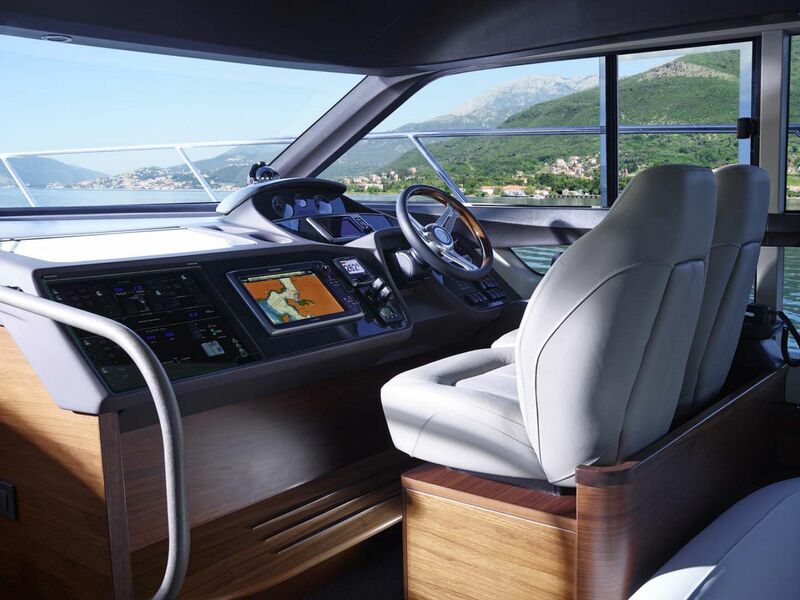 The master is large and comfortable with light from the hull windows. 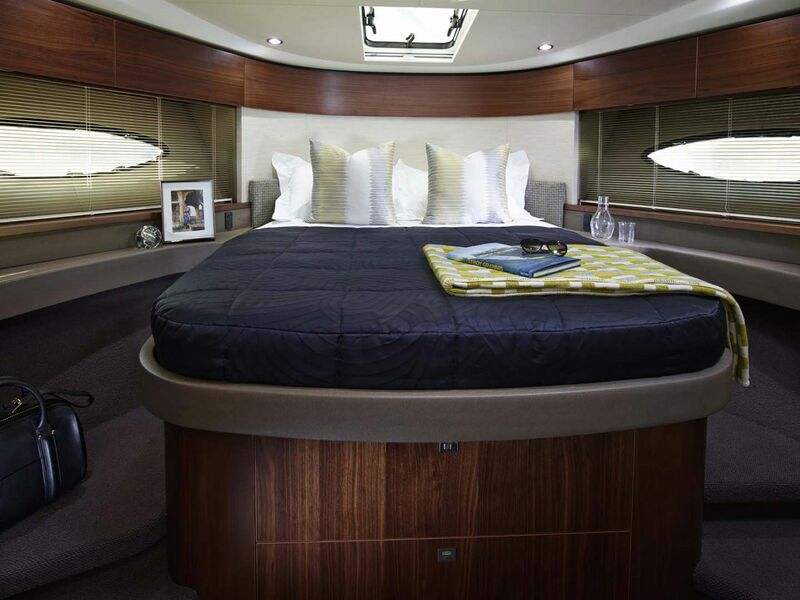 The centerline double berth fills most of the cabin with steps on either side up to the headboard. 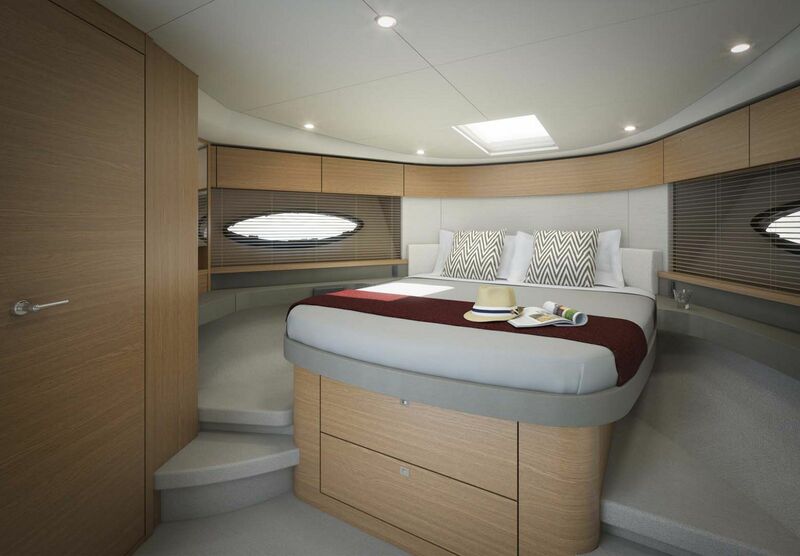 The master suite has its own private head while the guest cabin shares the day head on the boat. 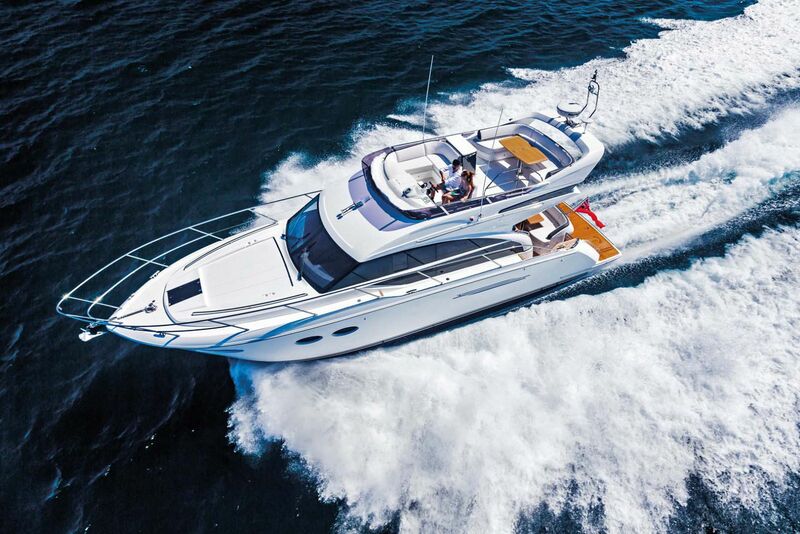 The sporty 43MY is powered by twin Volvo Penta D-6 370hp diesel engines, but owners wanting a bit more acceleration can choose to upgrade to the 435hp engines. 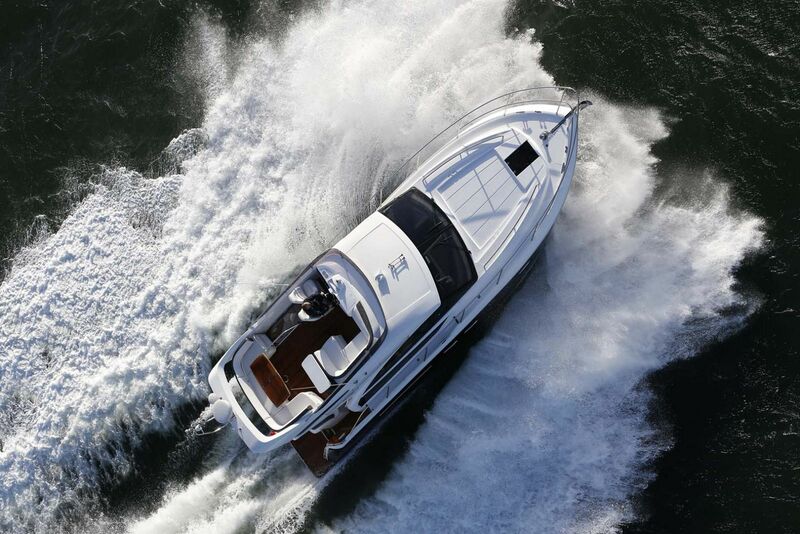 Top speeds can reach the low 30-know range while it cruises comfortably in the upper 20’s. 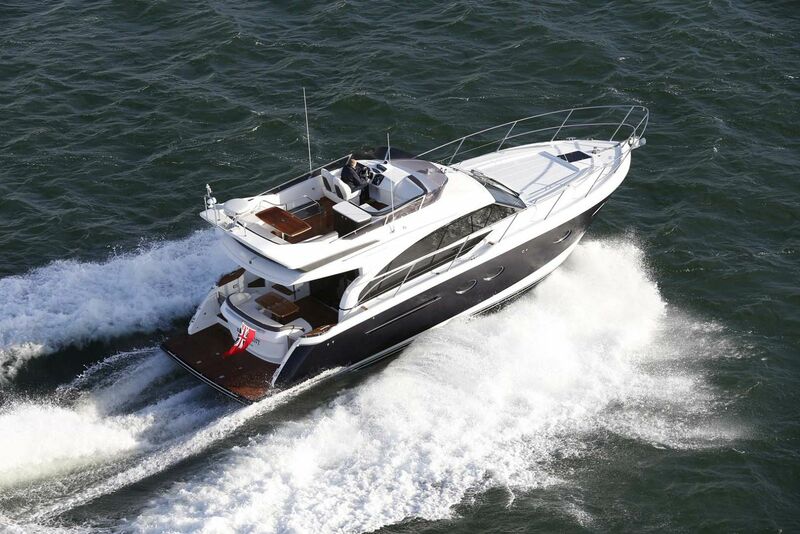 For more information on the Princess Yachts 43 Flybridge, please contact your Staten Island Yacht Sales Professional. 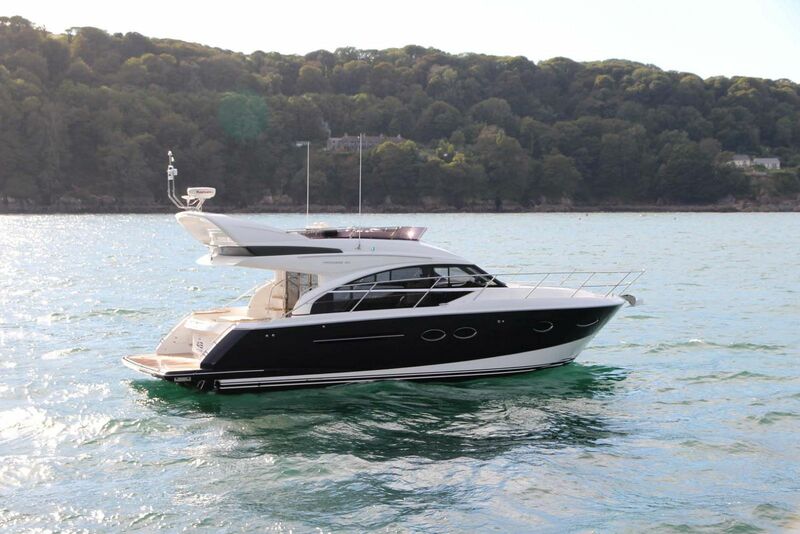 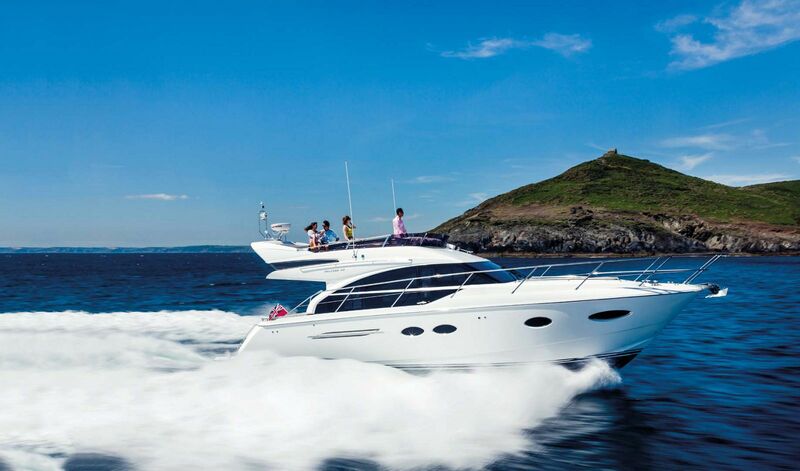 A video review from an editor at Motor Boat and Yachting magazine of the Princess Yachts 43. 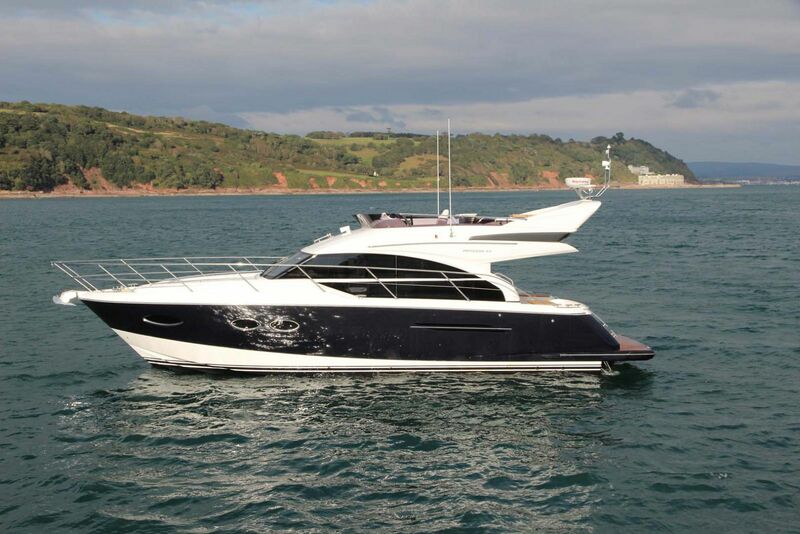 Princess Yachts official video trailer for the 43 Flybridge Motor Yacht.